#YouAreWelcome to Eastern Mennonite University (upper left, clockwise): Esther Tian, professor of engineering; student Sanghyun Park; students Aminata Wallet Mohamed and Monique Mutombo; and head track and field coach Brian Simpson. “You are welcome here” is the emphatic message offered by EMU students, faculty and staff in a new “blockbuster” video released just after President Donald Trump’s travel ban. The 1-minute short features 24 people, speaking several languages and hailing from a variety of countries, including the United States. It’s been viewed more than 20,200 times on Facebook, more than 200 times on Youtube, and 470 times on Instagram with hundreds of “likes” and shares. On EMU’s Twitter account @EMU News, the video has 1,431 impressions, 393 media views and 95 replies, mentions, retweets and likes. Andrew Strack, EMU’s photography and video manager, says this is an all-time record for an EMU-produced video. The message of welcome and reassurance was sent more formally on Monday, Feb. 6, in a statement by President Susan Schultz Huxman and Provost Fred Kniss. 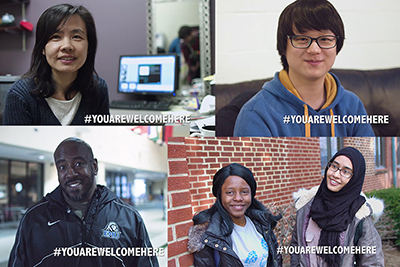 The #YouAreWelcomeHere campaign began with Temple University in November 2016 to reassure prospective international students after Trump’s election win that universities in the United States still welcome them. More than 1 million international students studied in the United States during 2016.EMU currently has more than 100 international students in undergraduate and graduate programs, as well as in the Intensive English Program. In addition to nearly 800 alumni living overseas, EMU holds a special place in the hearts of the 3,075 participants from 124 countries who have studied at the Center for Justice and Peacebuilding’s Summer Peacebuilding Institute. The campaign has been joined by other universities and organizations since Trump’s executive order halting immigration.